Looksima's mission is to make professional stylist services affordable for a wide audience. The company has a very unique concept: we define user's style and have professional stylists create fashion looks for different occasions. The user can then buy any of the items featured in the looks by clicking on the links provided next to the looks. The link then takes the user to our partner store selling the product online. 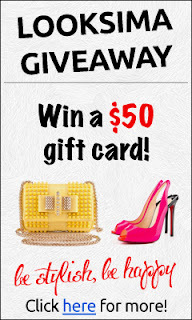 Stop by LookSima and enter to win a $50 gift card!! We love fashion and we want you to have fun while you find your style, choose what you want to wear and shop ‘til you drop! Who creates looks on LOOKSIMA? LOOKSIMA counts with a team of the finest stylists around, who are experienced professionals in the world of fashion and love making other people feel and look beautiful. How often will I receive new looks? Every day! We offer new looks for every occasion so that you can find something new and exciting for yourself every single day! Can I get a look created especially for me? Of course! If you want to receive advice on what to wear for a special occasion and would like to receive a look for a specific color, shape or style, we are here for you! We will help you look stylish and confident! We want you to love what you wear! My review of LOOKSIMA is WOW! You can click on Todays styles and be taken right to links to purchase the items! I find this so nice to able to see everything in one place. The items are nice and cute! There was so much to see and explore! The My Looks area changes daily ~Here you will see all looks designed by our professional stylists. Each look is created specifically for you, inspired by the latest fashion trends. There is a style BLOG~ In this section you will find trendy articles by Looksima bloggers, people who live and breathe fashion and know all about it! also a YES/NO ~ We have all been in a fitting room and couldn't decide to buy or not to buy. It’s good if you have a friend around to ask, but what if you don’t? Looksima is here to help! follow LOOKSIMA via facebook and twitter. Stop by LOOKSIMA today and check out your style and see some really cute items! You know you want to know what your style is!! And I remind you it is FREE CLICK HERE! disclosure~ a referral link is included in the post. This posting is part of a campaign from www.sverve.com and www.looksima.com. I was not paid for the post. Purex Insiders Now Accepting Applications!